Prometheus was always doomed to underwhelm to some degree. There was no possible way after a couple of stunning trailers, some cleverly constructed viral videos, the fact it was Ridley Scott's first sci-fi film since Blade Runner and it being tied to his genre classic Alien it was ever really going live up to all that hype in the eyes of fanboys, geeks and cinephiles around the globe. But I'd disagree. If you go into this film looking for essentially a remake of Alien you will be disappointed. My argument is, why on earth would you want to sit down to an inferior prequel of Alien in the same manner Episodes I-III of the Star Wars trilogy are - does anybody really want that? Didn't think so. Thankfully Scott realised this also and offered the audience something vastly different with the help of an extremely provocative script by Lost's Damon Lindelof and Joe Spaihts. He often stated in the process of making this it wasn't strictly a prequel to Alien and upon seeing the film I can finally see what he meant. Yes the film ties with Alien in some manners which will make you smile or despair in horror at reliving those moments again for the first time - as well as addressing one fleeting scene from the original film. However unlike Alien where the crew of the Nostromo are simply trying to survive, the crew of the beautifully constructed ship Prometheus are attempting to answer some of the biggest questions about life itself and by the film's end asking new ones in the process. It cleverly takes the story in a brand new direction for a sequel I'd very much like to see, without disrupting or shoehorning into Ripley's saga in the Alien films. The performances were terrific all round. Noomi Rapace was a compelling lead as archaeologist Elizabeth Shaw, attempting to sacrifice everything to achieve the answers she seeks. Comparisons will undoubtedly arise between her and Sigourney Weaver, especially in the latter stages of the story but she's a more whimsy and ponderous soul - on a more spiritual quest - and this lends itself to the film much better. Michael Fassbender as always stole the show being the token android known as David, who is never quite as it seems as his intentions are covered in ambiguity which reveal a brilliant plot twist I won't spoil here. Charlize Theron is quickly developing a knack for playing cold hearted b*tch characters as demonstrated in my previous review of Snow White and the Huntsman and February's Young Adult. With Prometheus it was much of the same as she was the representative of the Weyland Corporation to oversee the whole project and make sure it was done right. I quite enjoyed Idris Elba's nobel, laid back captain. Wasn't much to him, he was just there, like the audience, along for the ride. Logan Marshall-Green played Shaw's husband (?) and fellow archaeologist and good folly to Shaw's own beliefs, despite looking for the same thing. Another notable contribution was Guy Pearce's two minute appearance as an elderly Peter Weyland, I'd go into more detail but that would spoil the surprise. Where the film perhaps lost a couple of marks was in its pacing. For much of the first and second act it was this slow, drawn out, ponderous journey - which to its credit looked pretty stunning in 3D - without much true sense of dread. Then when the horror and monsters descended suddenly it reverted to the survival horror format we've experienced many times before, and in my mind it cheapened the experience slightly, as if Scott felt he had done his different thing for two thirds of the film and decided to remind people at the end; oh yeah there's aliens in this too. I can't deny though the film's final scene left me smiling and put a new perspective on the next time you watch Alien and Aliens...and Alien 3 and Resurrection if you feel you must. The visual effects were unsurprisingly stunning and the set designs inspired by H.R. Giger's vision on the original Alien films lent itself well to the aesthetics of the mysterious world Prometheus found itself in. Marc Streitenfeld's score was a curious creation though and in many ways refreshing for a film like this. It would've been easy to drown the film in Zimmer-like drones ala Inception, but instead he opted for something more hopeful his main theme. Don't sigh when I say it wouldn't sound totally out of place placed in a Star Trek film, this feeling of 'boldy going where no man has gone before.' If you haven't seen the film yet YouTube the main theme of the score and you'll see what I mean. After all is said and done Prometheus' hype probably transcended the film itself. Strip the hype away and in the long term I feel Scott accomplished what he originally set out to do. He wanted to create a new mythology set in the same universe he created, not rehash the same thing all over again. Prometheus is a sci-fi film drenched in philosophical ambiguity (rather than caustic survival horror) that the Alien films would never have dared to tackle, and will leave you trying to dissect everything about it for long after. For better or worse that isn't for me to decide. 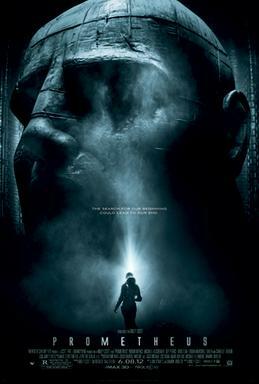 Prometheus is in cinemas across the UK now. Great review with some excellent points. I will need to watch it again as I think I was unfair with it. I gave it 3.5/5, but I think I should watch it again.